Where the Story Is …. “Geography of Nowhere” – the session at the Association of Writing Programs (AWP) conference on April 11, 2015, caught my interest before I noticed the powerhouse lineup of authors presenting (Kirstin Cronn-Mills, Nikki Loftin, Janet Fox, and Geoff Herbach). The topic of setting as character is one a writing pal and I have recently been discussing (read: obsessing over). How do some writers create a sense of place that roots the story and gives the characters context? On the flip side, how can we avoid the excessive description that I keep encountering in books I’m reading (and abandoning) recently? 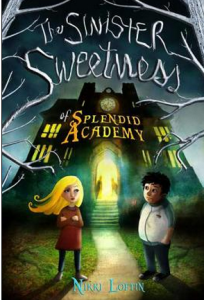 Details in “The Sinister Sweetness of Splendid Academy” by Nikki Loftin bring each corner and shadow to life. Setting is a sinister character. I walked into the session just as Kirstin Cronn-Mills talked about the setting of one of her YA books (The Sky Always Hears Me and the Hills Don’t Mind) as “fifty miles from the closest Target.” Brilliant! With six words she immediately conjures the expansiveness and confines of the character’s hometown. Each of the panelists talked about sensory details, like how the sound of wind changes at the top of a hill. And in some locations, you can’t overlook the weather. In Texas in August, Nikki Loftin said, the weather is a character; it’s there in the dust and the sweat and the sheer oppressiveness of heat. What about the settings that seem so mundane and repetitive to many of us? The suburbs or the residential housing along interstate corridors? Cronn-Mills sees these as “a blank canvas that you can embroider;” authors can create quirky places where kids want to go. My notes from this conference session are full of arrows and underlines, along with my own characters’ names and details of their surroundings. In the midst of revising a manuscript, the nuggets I gained from this session are helping me cut and clarify. And that is a glorious thing. This was my second year attending the AWP conference, and I again was overwhelmed by how helpful, instructive, and motivating these sessions can be. There were 13,000 writers in Minneapolis for the 2015 AWP gathering, and hundreds of sessions on the craft of writing. This is a hard-working and hard-writing group, and workshops were every hour, right through lunch and dinner, and beyond. The focus of the conference isn’t on writing for children — there were only a handful that specifically called out middle-grade — but every presentation I attended had a valuable take away. I want to be a better writer, and this focus on words — rather than marketing and selling — was pretty spectacular. From the Mixed Up Files of Middle Grade Authors blog.